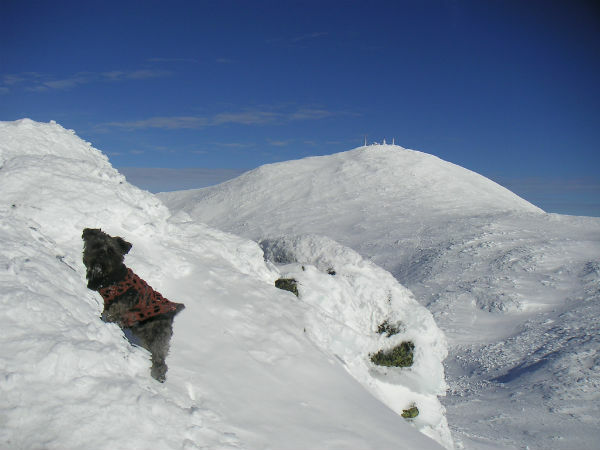 John and his dog, Pepper, both completed the Grid on Mount Isolation on April 6, 2013.
Pepper and I are just a couple of rather ordinary hiking mutts. I look around at the other Grid finishers and wonder how we belong here; they have done so much; they have had such exciting outdoors adventures. When all is said and done, Pepper and I have said and done very little in comparison. But 90% of hiking is just getting out on the trails regularly, and that we managed to do these past 5 years together. It has been a blast; all of it. As much fun as it was to finish the Grid; we will miss it more. 1. Ed for making the Grid into such a fun way to hike all the peaks, in all the months, in different weather. I think we know these mountains and trails pretty well by now, and we love them all in their own way, including Owls Head. 2. Georg, Per & Cinnilla, for their splendid companionship on the trails and introducing us to still more wonderful hikers. 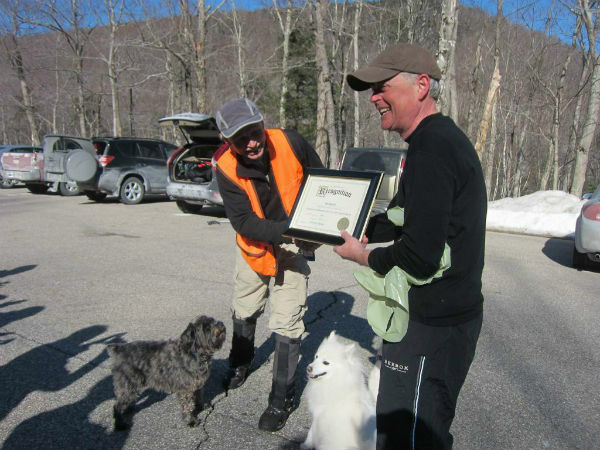 Pepper thinks these guys deserve an award for the best trail treats and another for their thoughtful contributions especially on our finishing hike. Pepper's certificate is as much a sign of their thoughtfulness as it is of his achievement..
3. Jeremy for encouraging me to come to the Ashland B&V and FOT, inspiring us to go for the Grid, creating the New England Trail Conditions Site which helped us plan our hikes and keep track of others, and more. 4. 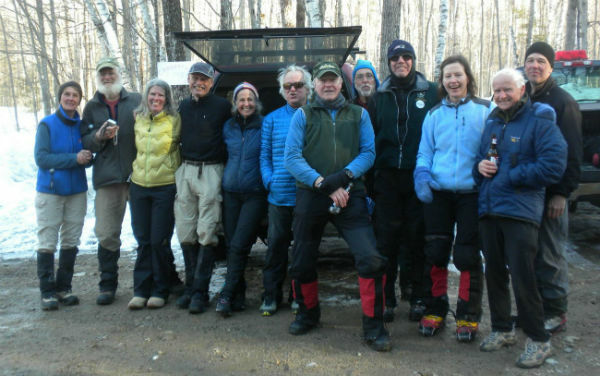 The Ashland Booze &Vittles regulars for sharing their friendship and enthusiasm for hiking in the White Mountains every month, and on the trails. It's really nice to carry a little bit of community into the woods and mountains, and to have a place to share one's passion for the same. What a great group. 5. 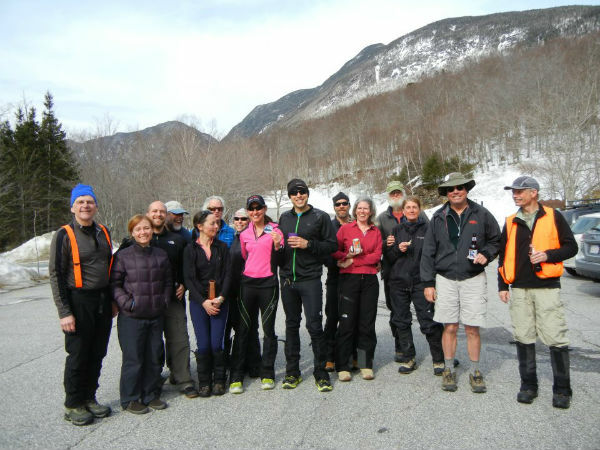 The trail maintainers and crews. 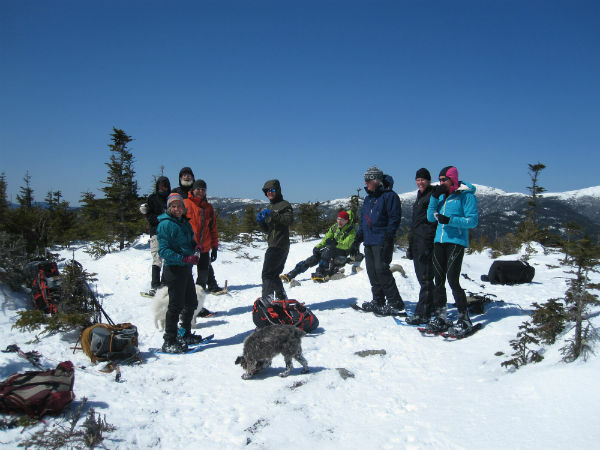 We rarely get a chance to thank these wonderful volunteers on our hikes. Like a good umpire they are often least noticed when they've done great work, but anyone who hikes a lot knows their importance. 6. Drs. Michael and Stuart Gordon. 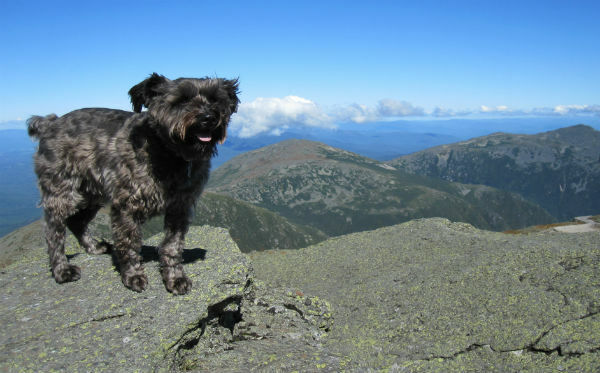 I stopped hiking 4Ks in 2006 and did none in 2007. Pepper hadn't hiked a single 4K either. I thought we might never do one together. I was ready to hike an out with no back. Mike diagnosed the problem, severe anemia, and Dr. Stuart identified the culprit, gluten. In April 2008 Pepper and I were cleared to hike 4Ks. Every hike since then has been a gift. 7. Shorty and Shadow, my first two mini schnauzer hiking buddies. Shadow did a lot of work with me whacking through the woods, but he only hiked a few trails. Shorty loved the trails; he was built to hike. It's because of him that I really started hiking 4Ks. He finished his 4K list with me months before coming down with diabetes; sadly never to hike again. Although they both passed away far too early, they still hike with us. I see them in Pepper and Pepper surely feels them in me. They will be forever young. Thank you all. Pepper gives you four paws up with a tail wag. Our finishing hikes were the best. They didn't end with the long planned big finish on Washington; they just sort of happened. It began with chance meetings on Tecumseh with Ed and then Larisa 2 weeks earlier. When it ended Pepper and I had finished our Grids April 6, 2013 together on Isolation with a great bunch of people and dogs. Cinnilla and Toby are missing from the picture. The others are Cynthia, Per, Nancy & Charley, Georg, Cory & Shiya, Mark, Val and Larisa. We briefly celebrated in the parking lot where Pepper received an award . . .
with Laura on her finish with some very distinguished hikers . . .
. . . and then shared the hike and tailgate for Larisa's finish the next day on Lafayette & Lincoln; all with another splendid group of human and dog companions. 4 finishes in less than 24 hours. What fun!